I teach the Certificate III in Automotive Technology apprentices, and I coordinate and teach the Certificate IV in Automotive Technology. I also teach commercial courses, such as currently teaching Nissan technicians from all over Australia electrical and hybrid vehicle competencies. 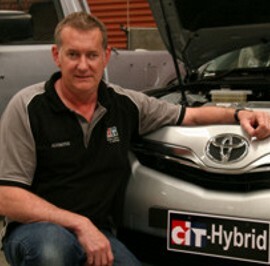 I have been teaching at CIT for nearly five years, but I have over 35 years' experience in the automotive industry. I knew from a very young age what I wanted to do. I lived in a small country town with my family across the road from a service station, and every chance I had on weekends or school holidays, I was over there helping them out and getting as involved as I could. After completing my own apprenticeship, I worked as a mechanic for just under a decade before setting up my own business in Wagga. I ran that for 20 years, employing a number of apprentices along the way. My partner's work eventually brought us to Canberra, and I approached CIT about some part-time teaching. While I had never done any teaching in the formal sense, when you have an apprentice in your business, you instantly become a teacher, and I had always enjoyed that aspect of my job. Having been an apprentice myself and working as a qualified technician for eight-and-a-half years before starting my own business, I understand what it's like to be in the shoes of the students. Most of the time I understand how they feel and know what they're going through. I remember what it was like being at TAFE and having to sit the final exam, and I understand the pressures. There is a lot of pressure that comes with having to work and study at the same time, and I think the students these days are under even more pressure. I am constantly developing my knowledge and skills. Particularly in an industry such as automotive, the technology is constantly improving and changing, and you really need to stay on top of things. I completed the Certificate IV in Automotive Technology, which encompasses advanced technology and diagnostics. I have also created a strong network of industry contacts across the world to ensure I’m always up-to-date with the latest cars, diagnostic equipment and technology. To further my teaching practice, I have also completed the Certificate IV in Training and Assessment, and have started the Graduate Diploma in Vocational Education and Training. I'm involved in a national motorsport team, working on the development of the engines and suspension, and I fly around the country several times a year to attend state and national championships. I have a range of friends who are still the owners of businesses, so I keep in touch with them and they keep me updated on what’s going on in the industry at their level. I thoroughly enjoy the leadership and mentoring role I play as a teacher. I believe mentors are important and that you should always have people who you can learn from and who can guide you. I have had a number of mentors who have definitely shaped my life. With one of my TAFE teachers in particular; I related to him well and so many of the things he said stuck with me, and still do today, and I find myself saying the same things to my own apprentices.